The Mountain, the twelve-foot-wide painting by Balthus in the collection of the Metropolitan Museum of Art, is one of the most disquieting visions of summer ever committed to canvas, a pastoral painted in 1937 with all Europe on the brink of catastrophe. It is a painting that I find myself returning to with a new kind of attention at the close of a summer that has had its own share of disquietudes. A party of seven has stopped on a plateau overlooking a dramatic gorge; three men and three women and a tiny male figure off in the distance. One woman has fallen asleep on the ground, another is stretching her arms high in the air, a man resting on one knee smokes a pipe (he has been identified as the guide), and a man and a woman stand at the edge of the gorge. The sky is cloudless. The day is perfect for a hike, for being with friends, for being in love. But something is amiss, though what is not clear. Everything about the beauty of the Alpine summer feels a little hard, a little strange. The vacationers, although surely friends and possibly in some cases lovers, hardly relate to one another. The three figures in the foreground are consumed by their own singular daydreams, while behind them the earth appears to be opening up, an abyss into which everybody and everything threatens to vanish. The seductions of summer are turning out to be illusions. The woman asleep might awaken to a nightmare—the fabric of Europe torn apart yet again, the human spirit now as dark as one imagines the bottom of that gorge. 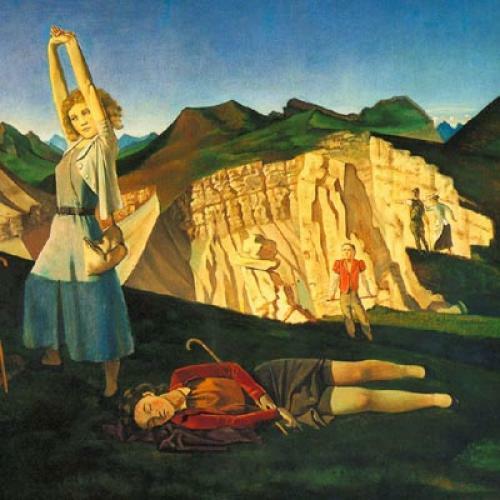 Balthus had apparently intended The Mountain as the first in a series of four enormous paintings dedicated to the theme of the Four Seasons, but this one painting was as far as he got. And so The Mountain stands as a fragment of an epic cycle, an attempt at allegory or story telling on a grand, old-fashioned scale. Part of the fascination of The Mountain rests in its uneasy relationship with the panoramic vision it aims to embrace, and in this sense it is kin to roughly contemporary works such as Pound’s Cantos and Joyce’s Finnegans Wake. A twelve-foot-long figure painting demands to tell a story, and yet Balthus is too much the modern man—too personal, too inward-turning, too skeptical—to corral his protagonists into a narrative that we can understand as having a beginning, a middle, and an end. There are astonishing feats of artistic invention on display in The Mountain. Few artists of Balthus’s time managed to create figures anywhere near as compelling as the blond woman who stretches her arms high in the air, modeled on the painter’s wife at the time, Antoinette de Watteville. And yet the protagonists do not exactly come together to create a convincing whole. They are each caught in their individual element. And one is left wondering if that was what Balthus intended. Like Pound’s Cantos, The Mountain aims for the grand synthesis but mostly distinguishes itself through flashes of crystalline lyric beauty. The Mountain is a painting in search of itself—in search of its own inner structure, its own meaning. And that, perhaps inadvertently, becomes Balthus’s subject. Amid the picture-perfect romanticism of the setting, the modern clothes and informal poses of Balthus’s friends and (maybe) lovers are something of a shock. These anxiety prone city slickers cannot help but bring their own unsettled emotions to the mountains where they have sought some peace. Balthus invokes an entire tradition of paintings of figures in landscapes—Poussin, Watteau, Courbet, Seurat, and Bonnard (whom he’d known when he was young)—and then he leaves that tradition in a state of crisis. He suggests that all the glorious nineteenth-century Alpine excursions and all the poems, pictures, songs, and symphonies dedicated to the sublimity of nature have come to naught. The Mountain is a painting dedicated to indecision, enigma, unrequitedness, the impenetrable nature of human affairs, the journey without an end, or at least without a conclusion. Guy Davenport, in his beautiful A Balthus Notebook, writes that “Balthus, like Kafka, is a master of gesture and posture. For Kafka the body was a semaphore transmitting a language we cannot read. Balthus’s gestures also defy interpretation.” Projected on the vast scale of The Mountain, Balthus’s defiance of interpretation—what Davenport calls his “existential kinetics”—become almost unbearable to behold. Balthus, seemingly the most apolitical of painters, has attempted to take the temperature of a party of pleasure seekers, and in failing to do so he suggests the impossibility of taking the temperature of his age. The weather outside—the beauty of the Alpine afternoon—tells us nothing about the weather inside the hearts of his protagonists. The summer that we see in The Mountain is not entirely unlike the summer we are living through right now. The expansiveness of the season mocks the limitations of the human spirit. Jed Perl is The New Republic’s art critic.